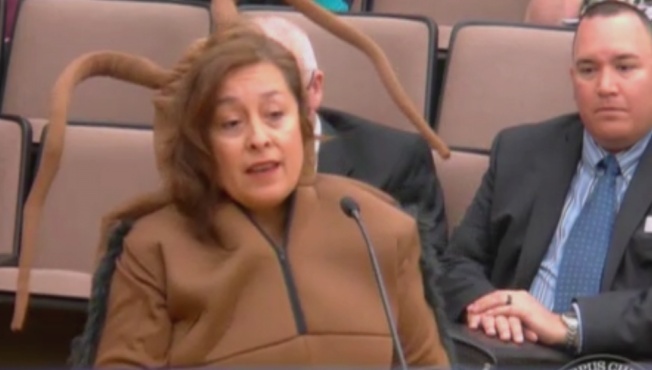 A South Texas woman showed up to a recent City Council meeting dressed as a cockroach. It's Patricia Polastri's latest attempt to bring attention to the influx of roaches and rodents near a major Corpus Christi road after new vegetation was planted, the Corpus Christi Caller-Times reported. The Texas A&M University-Kingsville professor brought a bag of dead cockroaches to a City Council meeting last month to complain about the vegetation planted along Ocean Drive. She said residents' safety is at risk by cockroaches and other rodents attracted to the street's palm trees and bushes. "I lived there when we only had three palms in that section of Ocean Drive; now we have 35," said Polastri, who has lived in the area since 2012. "In five blocks, we have 156 palms alone. The city is not going to take care of that." Council Member Ben Molina met with Polastri last month to walk the median and "understand the issue from her side of the story." "At first, she said it was more than just a roach issue to her," Molina said. "She talked about public safety, she talked about mobility, people walking in and out of there." Molina said he spoke with other residents along Ocean Drive and learned that most favored the planted vegetation. "That's why I didn't push further to have the city address the landscaping issue there," Molina said. "Because for the most part, a lot of the residents were in favor of the landscaping." But Polastri said most neighbors haven't seen the nocturnal pests because "the vegetation has grown too high." She warned that the pests will remain "invisible" until they create a hazard on the road.